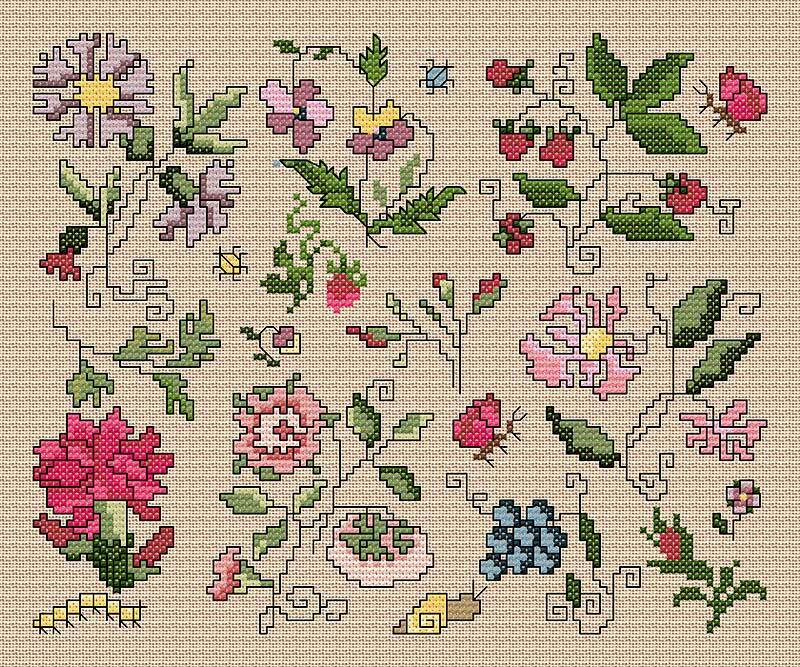 This motif sampler is one of my personal favourites - I love the very idea of just stitching something because you like the shape rather than it fitting with any particular shape. You could, of course, add a simpler plain border if you prefer. I have avoided fractional stitches on this project so you could work it on linen or Aida. To work out the design size (or the stitched area) you need to divide the stitch count by the number of stitches to the inch (2.5cm) on the fabric. You then add enough fabric to this measurement to allow for framing etc. If a stitch count is not shown on any design, you will need to count across the design and down the design, which will give you the stitch count. If working on evenweave fabric, remember that you generally work over two fabric threads, thus 28-count linen is also 14-count when doing the sum. I suggest adding 5 inches to the design size on a project to make sure you have an adequate margin for mounting and framing. Obviously you can adapt this amount when working a small card of lid top.